(Oct 2018) Building Python Programs is now available as of October 2018! That's right; the authors of Building Java Programs have written a Python version of their best-selling introductory Java textbook. The Python edition is coauthored with Allison Obourn, our close friend and University of Arizona CS Lecturer, who has been class-testing these chapters and materials with her students at Arizona. 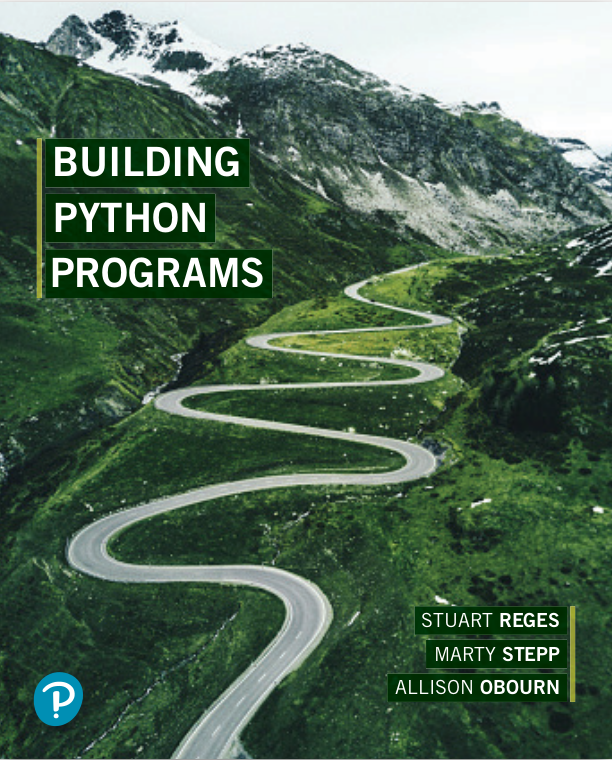 Check out the new book's official web site, buildingpythonprograms.com for more information or to request an evaluation copy! (Oct 2018) Building Java Programs, 5th Edition coming soon: The authors are pleased to announce that we have submitted our manuscript for the 5th edition of Building Java Programs, which is currently slated for release in Spring 2019. The 5th edition will see major updates to reflect the new features of Java 9-10 such as the JShell read-evaluate-print tool. Stay tuned! A new Chapter 19 on Java 8 and functional programming. A new section in Chapter 7 on 2-D arrays of pixels. A new section in Supplement 3G on image processing. New exercises and programming problems at the end of many chapters. New supplementary materials, videos, online practice problems, updates, fixes, and more. The fourth edition's ISBN is 978-0134322766. Order now or request an instructor evaluation copy! Welcome to the official authors' companion web site for Building Java Programs: A Back to Basics Approach. This textbook is designed for use in a first course in computer science. We have written it for a broad audience, not just for computer science majors. We have class tested it with thousands of undergraduates at the University of Washington, most of whom were not CS majors. 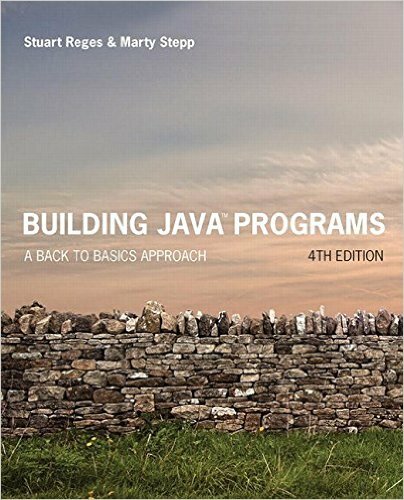 Please visit Pearson's official site for Building Java Programs: A Back to Basics Approach 4th edition and find the link for "Request exam copy". The fourth edition of our textbook, ISBN 978-0134322766, can be purchased from university bookstores and online booksellers. See our How to Order page for more details. The 3rd, 2nd, and 1st editions, now out of date, used the ISBNs 978-0133360905, 0136091814, and 0321382838 respectively. We recommend using the new 4th edition for the best and newest content. Our book uses a "back to basics" approach that stresses fundamentals first. We know from years of experience that a broad range of scientists, engineers and others can be taught how to program in a procedural manner. So our book begins with a traditional procedural approach. Once we have built a solid foundation of procedural techniques, we turn to object oriented programming. By the end of the course, students will have learned about both styles of programming. Our book is also problem-centered. Rather than just describing programming constructs, we talk in detail about how to apply each construct and where a novice is likely to go wrong when learning how to use each new construct. All of our early chapters end with a comprehensive "case study" example so that students can see how to apply the new concepts to a mid-sized program. At the University of Washington, we cover a chapter each week and have a different programming assignment each week to allow students to practice the new concepts. Finally, our book is layered in the early chapters so that students don't become overwhelmed. Teaching a novice to program is like building a house of cards. Each new card has to be placed carefully. If you rush the process and try to place too many cards at once, the entire structure collapses. Please also visit Addison Wesley's official promotional web site about our book, linked below. I believe this book delivers on its title. It is a well written book that focuses on the basics of learning a programming language without getting lost among "hot" topics like OO, IDE's, or GUI's. I will be switching my classes to this book. [This book is] very clear and appropriate for the level of a college freshman or intro learner to Java. It is obvious that the authors teach the course and understand the needs of the students. I like [the authors'] story-telling writing style, which is very appropriate for the novices. Important concepts are gradually introduced with an appropriate logic of precedence. [The] reading level for general introductory programming course is ideal, [and the book is] well-suited for non-computer science students... Concepts are discussed in a crystal clear fashion so students should be able to answer questions. The liberal use of graphics, including those created with text, is a powerful technique for helping learners to understand algorithms, concepts, etc... The figures greatly enhance the corresponding narrative... perhaps one of the text's strongest features. [The text is] very readable. I like the carefully done examples [and] that previous examples are repeated so the reader doesn't have to page back to find it. The author[s have] chosen wisely to present enough material without trying to include everything. [The book] flows smoothly from one topic to another... The authors intentionally produce 'buggy' programs to demonstrate common errors. I like this, and I feel that most textbooks only show 'masterpiece' programs. This is a VERY nice book. [...] The highlights of this book are: starts with a procedural approach (objects come later, but they use objects like Strings early on); very readable; LOTS of clear and relevant examples; non-trivial examples (like reading a large text file to compute and sort a list of unique words); and very good attention to loops, functions, ArrayLists, LinkedLists, iterators, the Java Collections Framework (introductory data structures like HashMap, TreeMap, HashSet, TreeSet, but doing so in a nice way that doesn't overburden the student) ... and the authors also give programming tips, short-cuts, and good attention to off-by-one errors (e.g., fencepost cases).